This design was stitched for a seminar in Sante Fe. Appealing chile ristras and wreaths adorn homes throughout the Soputhwest as warm symbols of hospitality. The fresh chilies are also a staple in the local diets and I chose to portray a cluster of them shortly after they have been harvested instead of in the usual dried state of the ristras. These interesting red pods with smooth edges are an ideal vehicle for teaching a stylized shading technique that I developed using couching techniques. Because my favorite method of sophisticated shading — the beautiful long and short — is more challenging to do on canvas without piercing the canvas threads, I chose to use a simple two-way laidwork pattern that was originally inspired by the elegant or nué technique in silk and metal embroidery. Horizontal and vertical rows of laid threads form the foundation layer in each chile pod and then cross stitches are used to not only secure these long laid threads but to distinguish the shaded areas. To shade the four foreground pods, two different red metallics are used for the trellis foundation and two shades of red #8 pearl cotton add the cross stitch tiedowns (a regular red and a deeper Victorian red). The Stem outlines for these chiles are executed in the same Victorian red pearl. The three background chilies will have a slightly darker metallic background with both laid rows in the same deeper red metallic, and the crosses are executed in the Victorian red pearl cotton and the darker value used for the outlines. Some chiles will also have some solid red areas in Encroaching Gobelin to suggest wrinkled recesses. The leaves and veins of the chiles are outlined in Stem and the caps of the pods are embellished with an Open Web variation. The leaf filling is stitched in Diagonal Mosaic in two colors — the Tent stitches are in green metallic and the longer stitches are executed in a light moss green pearl cotton. MAT PATTERN - Instead of a formal border, a simple trellis mat treatment is used around the circle outline. The pattern is a simulated caning pattern that combines ivory laid rows with green metallic diagonal darning rows in two directions to suggest the caning “circles.” The circle outline is executed in Rice units, using the same green metallic for the foundation crosses and ivory pearl cotton for the top stitches. 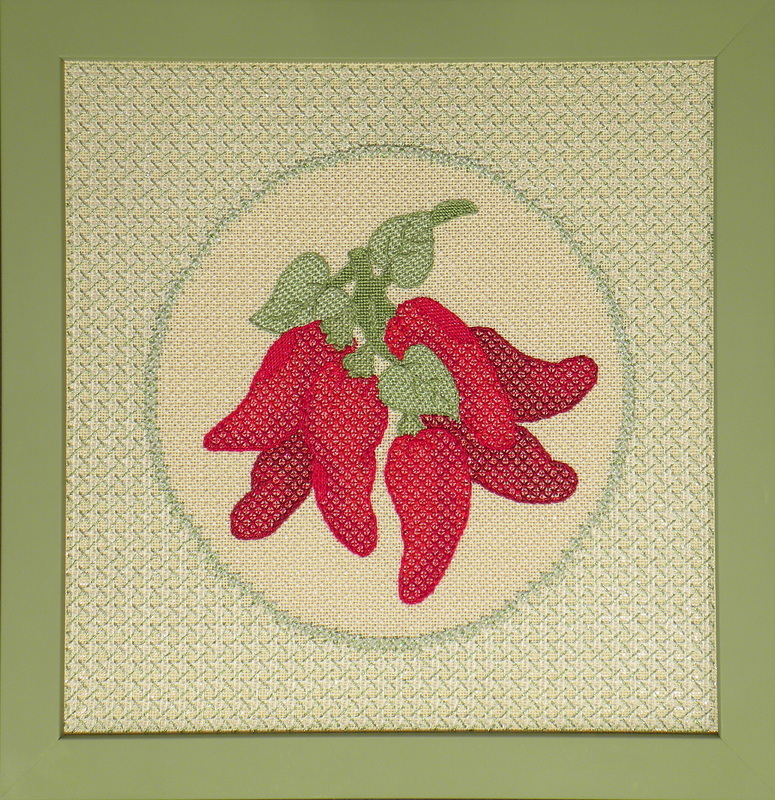 BACKGROUND - The open pattern around the chiles is a simple open “T”pattern in ivory pearl cotton. This filling is actually the green darning rows of the mat pattern without the layer of laid rows underneath so the count and scale are very compatible with the circle outline. An efficient “flip flop” running stitch technique is used to execute this pattern and it automatically conceals the traveling threads since it places them behind canvas threads. COLOR CHOICE - Two shades of green are offered for the leaves and background accents - sage or moss green threads. The model uses moss greens. Materials: All materials needed to complete the design plus a detailed instruction booklet with a color copy of the finished model on the cover and some detail views. 14" X 14" stretcher frame not included.